2008 Surgery: vitrectomy (eye juice , see vision page). 2009 540 units of Botox injected in my lower and upper left leg, arm, shoulder and neck for movement disorders related to spasticity and flexor synergies. 2010 625 units of Botox injected in my left side. 2011 675 units of Botox injected in my left side. The marked dose increase was because I recently acquired a weird internal rotation of the shoulder, arm, and finger flexion. 2013 840 units. This was waaay too much Botox. I had serious side effects, i.e. breathing, whole body weakness). Really scary. These level doses are in clinical trials….I am not in a study. From the medical gossip I hear…700 units should be the max, but not for everyone. 2012: Angiogram (Arteriogram): 5 year post surgical follow up to see if new aneurysms developed. “Clean as a whistle!” said my neurosurgeon. Next arteriogram to visualize blood vessels in brain:save the date in 10years…2022! However, I just completed a baclofen pump trial in January 2014. The results look and feel promising. I have a prep-op and get scheduled for the installation. 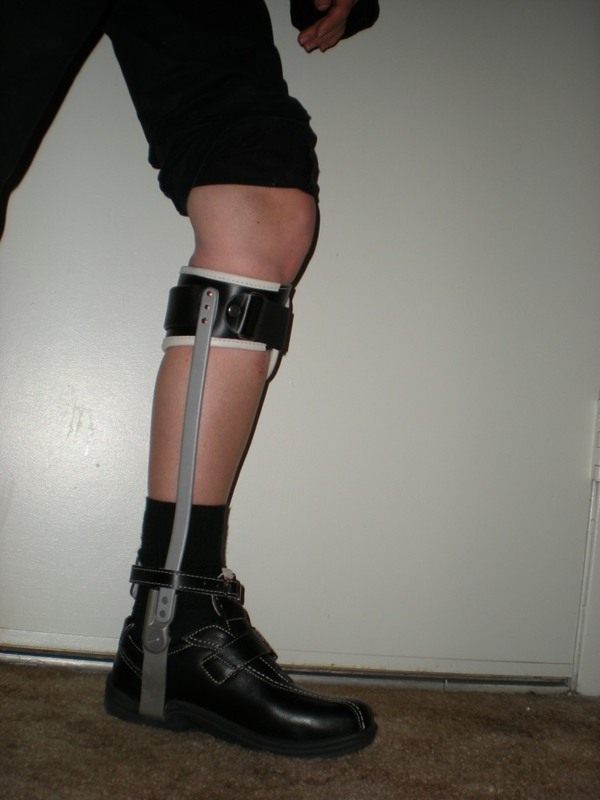 Excited about the potential benefits and reduced spasticity? 03/2015 – Intrathecal Baclofen (ITB) removed! The pump only worked for 2 months out of the 12 months I had it. 3 serious complications: 1) hematoma at the surgery site; 2) Medtronic telemetry device programming error lead to an overdose of baclofen and, 3) the catheter developed a serious kink (90 degree bend), so I was not receiving the appropriate amount of medication. Instead of replacing the pump, I decided to have it completely removed. The risks outweighed the benefits. Now, back on Botox, Physical and Occupational Therapy for limb spasticity relief. 11/2014 – I had a couple significant falls 2013 & 2014 where I broke bones and decided as a measure of precaution to get a walker. No falling for this gal. I researched and was selective. 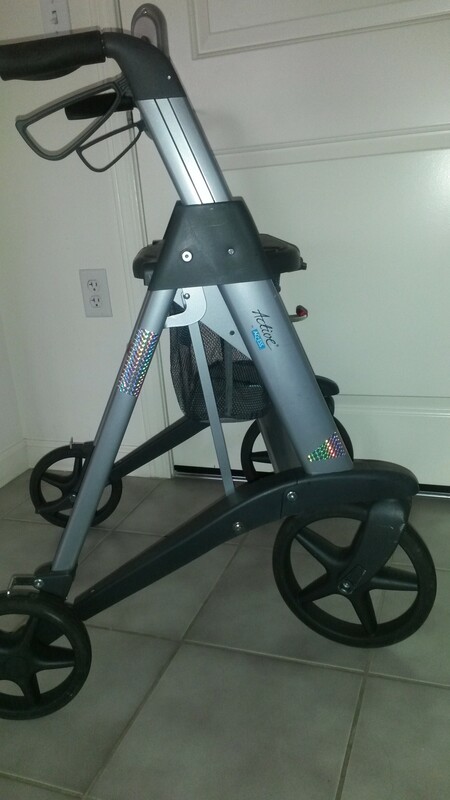 This one has big wheels, small turning radius, and is stylish! I walk it! No falling for this gal. 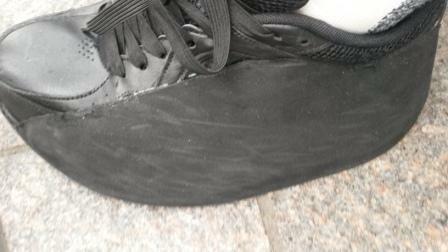 I just got a shoe wedge to prevent me from rolling on the side of my foot. I still twist my foot in my shoe, but it prevents me from rolling over it. After the surgery I was transferred to NeuroICU for recovery and for vasospasm, hydrocephalus, and intracranial pressure watch. A Vasospasm is when the blood vessels in the brain get irritated and constrict blood flow, leaving a very good chance of experiencing an ischemic stroke. Blood in the brain can also trigger seizures. I had a lot of tubes sticking out of me. Postoperative day two, they removed my breathing tube. I remember the first question they asked me was, “Do you know where you are?” Confidently, I replied “Santiago.” I had planned on taking a trip with my parents to Santiago, Chile in November. The brain is very uncomfortable with lapses in consciousness so it will respond with a “confabulation” (logical assumption to account for the missing time period). I started to talk using single words or nodding my head to communicate. I would move my right side spontaneously, while my left side remained plegic (paralyzed). I was heavily medicated for the pain. Dilaudid, a morphine based medication, was an incredible pain killer. The UCSF Neuro Team did everything they could to make me feel more comfortable. I made gradual improvements. By the last week of August I began becoming more verbal. I lst my maturity and talked like a little girl. I was convinced that one of the nurses harvested my kidneys and sold them to pay off her student loans. I thought I smelled marijuana on my nurse’s gloves. I also thought she worked for my employer. I told her to clock out and get drug tested. After hearing the presidential candidates’ debate on the radio, I went to sleep and thought my Dad was running for president. I demanded to have my laptop so I could take care of work that needed to get done. I believed I was on the Hospital Ship and the pirates were coming. You know a survivor is getting better when she knows she shouldn’t be peeing and pooping in a bed. I pulled out my catheter because I was so mad I could not pee on my own. Around that time, I started using a bedside commode, which I must say, is a bit of a challenge with my left side not helping. Friends or family would help me to and from. My head with all the staples started to itch like crazy. All I wanted to do was pick at it. I kept on getting yelled at from everyone to stop picking because I would cause an infection since germs travel in my finger nails. The aftermath from the VP shunt surgery was very uncomfortable. The incision was done on the right side of my belly and it felt like someone threw Alka Seltzer in there. My right abdominal muscles with the incision were all I had to work with to sit up because my left ones were paralyzed. I did some speech therapy, primarily a swallow test to see if I could safely swallow my own food without choking. I also did some occupational and physical therapy although I do not remember exactly what my therapists had me do but it involved following commands. I was able to follow instructions with my right side yet; my left side was still plegic. Everyone felt I would benefit from rehabilitation therapy. My Mom checked out both programs available in our area. I was transferred from UCSF to Alta Bates Brain Injury Program. I was ready to make lemonade with the lemons given to me. I arrived close to 4pm on 9/11/07. I was super bummed out because I expected to immediately start therapy and have a cheerful committee with balloons welcome me to rehab. That night at mealtime, I was in my wheelchair sitting next to a guy who looked like Morgan Freeman. He was tapping his fingers and told me to tap my fingers all the time, as often as I could. I looked at my dead hand and it would not cooperate. Little did I know, I was starting to rebuild the neuro pathways just by thinking about moving my fingers. I was evaluated by each discipline so they could develop an integrated plan for my recovery. PT and OT are interrelated so sometimes I would have a “co-treat”. An immense amount of time was spent “activating” my left side and learning how to safely “transfer” from the wheelchair to the bed or the toilet. My left side was highly uncooperative but, over time, my finger moved, I was able to place weight on my left leg. Activating my left side involved series of exercises that would build on each other. Since my injury affected my non-dominant side I had to learn to use my non-dominant side for dominant activity. It’s natural for the unaffected side to want to take over and I developed some compensatory strategies. Therapy aims to minimize the compensatory strategies and have you relearn how to do everything you once took for granted. As my deficits were uncovered during therapy, my therapists would explain the deficit. If I knew something was wrong, then I would learn what I needed to do to fix it. My deficits were obvious to everyone, except me. A typical day in rehab was breakfast at 7:30am wheeled to the dining room by a nurse or family member, select the next day’s meal choices with the ST. Back to my room for OT to learn how to safely dress myself with a floppy left side, ST, PT, lunch, maybe Rec Therapy, another OT and maybe PT, then dinner. I was fatigued but, highly motivated to do anything I could to get better. Every other day, I was allowed a shower. I would transfer to a shower chair and, get wheeled down the hallway to one of the shower rooms. PCAs or Nurses would help scrub me, especially my scabby swollen head, shave my right armpit hair.. I looked forward to my showers. Then, I would get tucked in and covered with heated blankets just to do it all over again the next day. I would get so frustrated when a 75 year old patient would be walking up and down the hallways before I even walked. By the beginning of October I had taken about 5 steps in between parallel bars. That was the best feeling. I had not walked since August 15th. 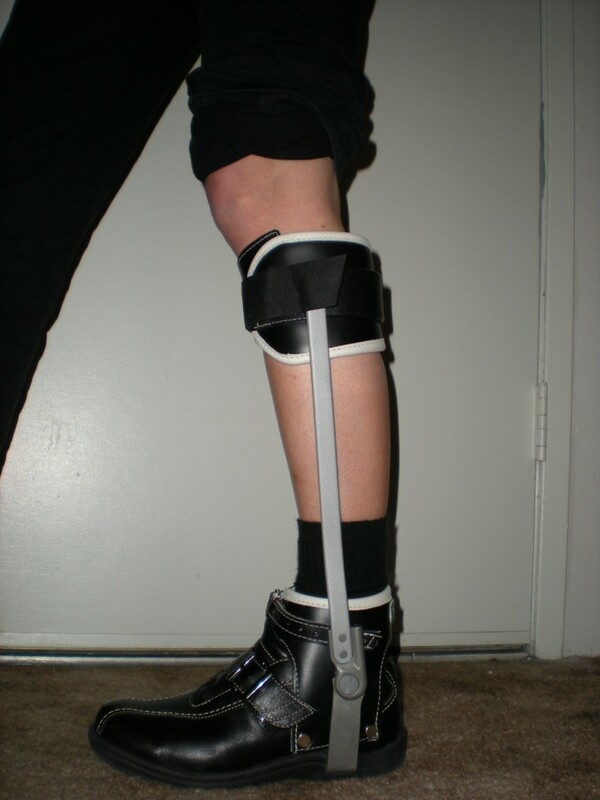 By the end of October, I was walking about 30 steps with the assistance of a cane and an AFO (Ankle Foot Orthotic). I had also learned how to ascend and descend the stairs. I was discharged from Alta Bates with a wheelchair, a cane, and an AFO to continue my OT, PT and ST in an outpatient setting. At this point, the best recipe for continued recovery is outpatient therapy, doing the home exercise program they prescribe daily, and then challenging yourself by doing a variety of new things. Remember, something new, can be something you used to do pre-injury and have not done since the injury. Also doing a lot of bilateral activities, like washing dishes, helps your affected limb begin to gain its own identity, rather than being the “helping hand”. It is very important that your Outpatient OT and PT have specialized in NDT (Neuro Dynamic Therapy) or, PNF (Proprioceptive Neuromuscular Function). To graduate, an OT or PT must take at least one Neuro Class. However, you want a therapist who takes continuing education in Neuro or, has specialized in Neuro. I was discharged from ST in February ’08. I continued to work on ST on my own by playing word games, doing logic and deduction puzzles, reading, listening to books on cd, planning and organizing fiscal matters and, researching topics on the internet. I purchased the Brain Fitness computer program from Posit Science to help with auditory and visual processing. At first I tried an Outpatient Rehabilitation Group that visits you in your home. I was not very happy with the therapists. I decided to move back in with my parents since they are semi-retired and available to help get me to therapy and doctors’ appointments. I transferred my care to Alta Bates Outpatient Therapy. What’s great about a hospital outpatient setting is you have extra sets of eyes adapting your therapy program. It takes a village. I had regained a lot of function; however, I needed more of a challenge to get me to the next level. In April 2008 I transferred my care to UCSF Physical Therapy at Mission Bay. Dr. Nancy Byl has really been creative in designing a PT program which also incorporates OT elements that has taken me to the next level. When I started at UCSF Mission Bay I could not hold a glass of water with my left hand and turn my head without dumping the water on myself. I could not stand balanced on my unaffected leg and turn my head without falling. I still have lingering deficits but, my goal is normalcy and reducing the chance of injury to my unaffected side from abnormal gait. This fine tuning I am doing takes a long time and a lot of repetition. I had to find a physiatrist to oversee my rehabilitation. I tried a few out but, they were either not a Preferred Provider or, our personalities did not match. I finally found a extraordinary physiatrist at UCSF Neurology, Dr. Gary Abrams. He really understands neurological deficits from CVAs (cerebrovascular accidents) and the steps that need to be taken to overcome these deficits. Because of my significant movement disorders on my affected side, I was referred to a fantastic movement disorder specialist, Dr. Glass. He administered 265 units of Botulism to paralyze the six major muscle groups responsible for my toe curling and foot inversion. I had in depth cognitive testing administered by a talented Neuropsychologist, Dr. Tatjana Novakovic-Agopian. I wanted to learn of any hidden cognitive deficits that would impact my ability to return to work someday and regain functional independence. I also pursued acupuncture, chiropractic, vision therapy, massage therapy and hyperbaric oxygen therapy. Throughout my rehabilitation, I have been very determined and remained very positive. I have only really had three terrible days of crying and self pity. Like my employer used to say “Negatism breeds complacency”. Overall, I feel very lucky that it was my brain that was injured because the brain wants to heal and has neuroplasticity (the brain’s ability to reorganize itself). I may have some permanent deficits but, I know the non-permanent deficits will continue to get better the more I challenge myself and vary my routine. 2)October ’07-March ’08 AFO (Ankle Foot Orthotic) Hard plastic cast thing that fits in your shoe and holds up your ankle. 4)October ’07- July’08, May ’11 Cane After repeated falls in 2011, I am back using a cane. However, my doctor would prefer a 4-wheel walker. 5)Voice activated software, to help with typing since my affected hand has trouble typing. 6)February ’09 The Walk Aide System This device attaches to my calf and sends neuromuscular stimulation to bring my foot up and out during the swing phase of my gait. No more foot drop. 7) April ’09 Sleeping Brace I got a very light weight dorsal night splint and wear toe separators. Since my achilles heel is very tight, I want to get as much as I can from the paralysis of the Botox. If I am able to stretch my achilles heel by keeping it flexed and straighten my toes while I sleep, it can only help with regaining range of motion and dorsiflexion for more normal gait. 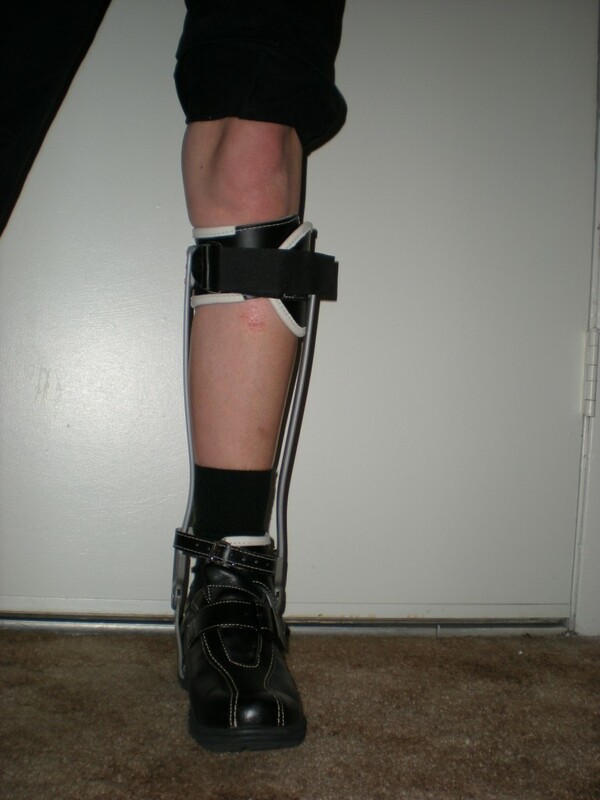 8) May ’11 Orthotic This helps reduce spasticity and abnormal foot position from walking on an inverted foot. 9) December ’11 Ankle Foot Orthotic (AFO) Instead of a tendon transfer surgery, I am trying another AFO with the botox so I can prevent walking on the side of my foot (equinovarus contracture deformity (club foot). AFO: Inside view. Shoes are fashionable. The afo attaches to the shoe…pretty nifty. AFO: Outside view. See the extra pull my foot up strap? Front view. I am thankful my pant legs fit over it.